"This is a baked version of the popular spicy appetizer. Use more or less cayenne to taste." Preheat oven to 400 degrees F (205 degrees C). Coat a baking sheet with a nonstick spray. In a bag, mix together flour, 1/2 teaspoon garlic powder, 1/2 teaspoon cayenne pepper, and 1/4 teaspoon salt. On a plate, mix the bread crumbs with the rest of the garlic powder, cayenne pepper, and salt. Shake the chicken pieces with the seasoned flour. Beat egg whites with 1 tablespoon water, and place egg mixture in a shallow dish or bowl. Dip seasoned chicken in egg mixture, then roll in the seasoned bread crumb mixture. Place on prepared baking sheet. Bake for about 8 minutes in the preheated oven. Use tongs to turn pieces over. Bake 8 minutes longer, or until chicken juices run clear. 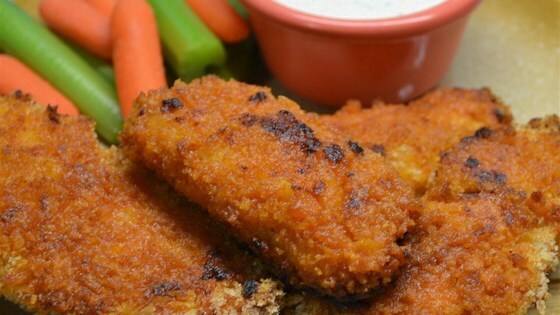 A lower-fat, baked version of spicy Buffalo chicken wings. I loved this recipe-I took other reviewers' advice and used 1/2 the cayenne and served them with Honey BBQ sauce. Great recipe. Based on reviews, I added Frank's hot sauce for the last 5 minutes of cooking. I used the leftovers the next day and made a buffalo chicken salad. Yummy and healthy.